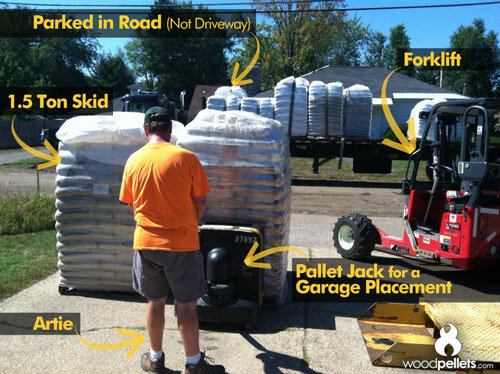 The above photo shows a normal Premier Delivery in process, where the skids are delivered into a garage. For all deliveries, the truck is parked in the street, not your driveway. The forklift is used to remove your skids from the truck to bring them where you have indicated. If you ordered a Precision Delivery, like the one pictured, an extra step is involved. A pallet jack is used to pick up the skids from where the forklift placed them, to carefully transport them to your desired space within your garage. To see how a standard Value delivery works, watch our video of one here. 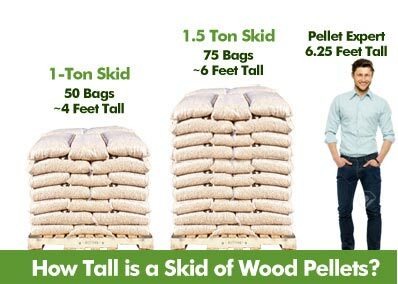 A pallet of stacked wood pellet bags (referred to as a skid) can come in either 1-ton and 1.5-ton sizes. No matter the weight, all pallets are 48 by 40 inches. The height of the skid depends on the number of stacked bags. A 1-ton skid holds 50 forty-pound pellet bags, and is about four feet tall. A 1.5-ton skid holds 75 forty-pound pellet bags, and is about six feet tall. If you’re having wood pellets delivered to your home for the first time, or are storing them in a new location, it’s a good idea to measure out the space first in order to know what you can fit. Some expected characteristics of your wood pellets include bag vents, condensation and a woody scent. Bag vents are rows of very small holes, and are a necessary part of the bagging process. Their purpose is to help to keep pellets aired out and protected from moisture, in the event of even a tiny amount of leftover warmth from the manufacturing process at the time of bagging. Also, the vents prevent bags from popping and breaking while being moved around and stacked. If there are large, random holes, these are not vents and should be patched up immediately. If you find damage that has affected the actual wood pellets – call 1-800-PELLETS within 30 days of delivery to speak with a Quality Assurance representative. All Woodpellets.com Quality Certified fuels are backed by a Physical Quality Guarantee, which is valid for 30 days after the delivery date. Your skids will arrive wrapped with a protective shroud, which should also be inspected upon delivery. If you notice some condensation within the protective layers – it’s perfectly fine. Sometimes certain weather conditions can cause this moisture, it and will not affect the quality of your pellets. The pellets have a woody scent – which varies among the type of pellet you’ve purchased. This clean, natural scent is due to the 100% wood fiber makeup of the pellets, which have no binders or additives. Shroud Tears: Minor tears happen occasionally, but a quick and easy fix is to patch with duct tape to prevent any water from leaking in. If there is major damage to the protective plastic, check to see if there has been any damage to the pellets. Call us immediately if you find any. Bag Holes: If you see large or irregular holes in the bag (that aren’t bag vents), patch with duct tape to prevent water intrusion. Check to see if there has been damage from the holes, and again – call us if there has been. Previous article Should You Schedule a Home Energy Audit?